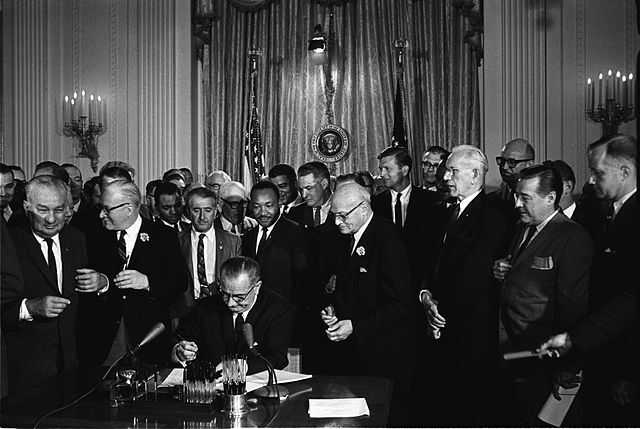 One of the landmark pieces of legislation in the battle against discrimination was the Civil Rights Act of 1964 which President Lyndon Johnson signed into law on July 2 of that year — an event that will be commemorated tomorrow with a keynote address by President Obama at the LBJ Presidential Library in Austin, Tex. President Kennedy had called on Congress in 1963 to take action on a broad civil rights measure, but it was only after his death that Johnson was able to win its passage. More than half of Americans (58%) considered the act to be one of the most important events of 20th century, ranking fifth on a list of 18, according to a 1999 Gallup poll. But as historic as it was, a half century later many Americans — particularly blacks — still believe that the country has a ways to go in overcoming racial disparities. A CBS News poll conducted in late March found that while 59% of Americans — including 60% of whites and 55% of blacks — considered race relations in the U.S. to be generally good, about half (52%) thought there was real hope of ending discrimination altogether while 46% said there would always be a lot of prejudice and discrimination. 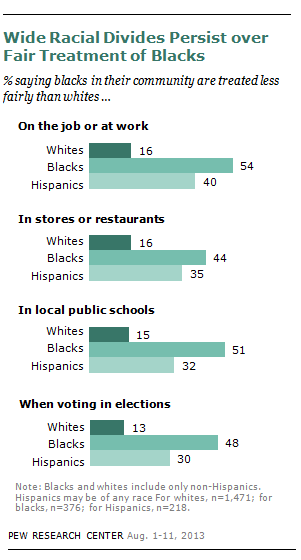 About six-in-ten blacks (61%) held the view that discrimination will always exist compared to 44% of whites. In a survey conducted last year before the 50th anniversary of the March on Washington, the Pew Research Center found that fewer than half (45%) of all Americans said that the U.S. had made substantial progress toward racial equality since that historic event, while 49% said a “lot more” needs to be done. Among blacks, just 32% said the country had made a lot of progress since the 1960s and about eight-in-ten (79%) said a lot more work needs to be done. Whites have a sunnier outlook: About half (48%) said a lot of progress had been made and, compared with blacks, a smaller share (44%) said a lot more needs to be done. The racial divides in assessments of how much progress had, or had not, been made extended to the specific areas that the 1964 act addressed: equal employment opportunity, public accommodations, public education and voting rights. A larger share of blacks than other racial and ethnic groups today said that blacks in their communities were still treated less fairly than whites when it came to these areas. Hispanics tended to fall somewhere in between whites and blacks on these questions. In the survey, about a third (35%) of blacks said they had personally experienced discrimination or been treated unfairly because of their race or ethnicity over the past year. That compared with 20% of Hispanics and 10% of whites.